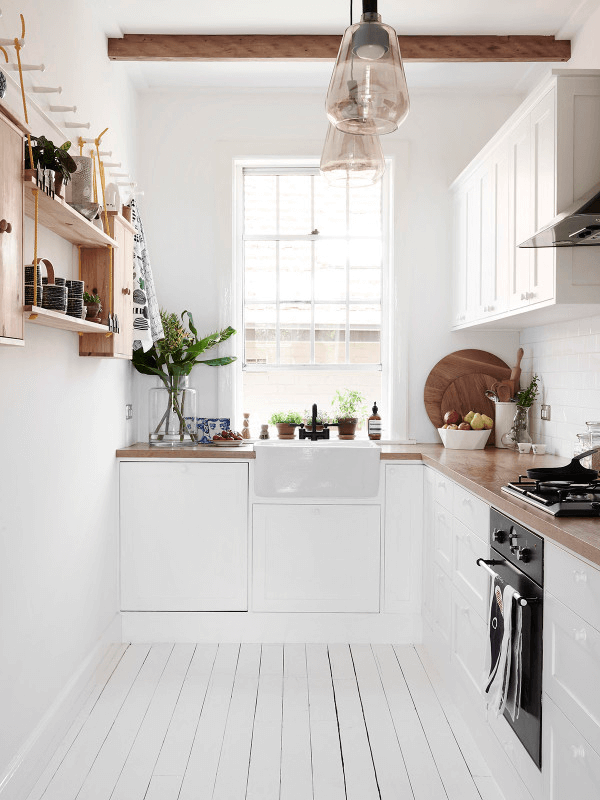 minimalist kitchen design ideas you should probably be pinning. Anyone with a Pinterest account can find kitchen inspiration. We love a good modern classic look for sure, but a minimalist kitchen has sense of welcome to it that can’t be replaced. Here, warm wooden details complement the whitewashed finish of this rustic kitchen, where the absence of a multitude of decorative accents is supplemented by organic textures and natural pieces. A soothing shade of baby blue lends a modern touch to the otherwise traditional finish of the kitchen’s cabinetry. A Mediterranean-inspired floor tile design sets an exotic element within the space, seamlessly blending in with the elegant aesthetic. Square subway tiles and a marble countertop steal the spotlight in this dreamy vignette. Delicate bulb fixtures with sleek metallic detailing emulate the hardware of the kitchen, extending a much-needed layer of shine to the space. Stained leather pulls offset the intensity of the streamlined cabinets, instilling a dynamic effect to the contemporary make of the room. Psst! We’re loving the rawness of the unstained flooring. How very dreamy. Minimally decked kitchens can often run the risk of lacking life or warmth, especially when an exclusively contemporary aesthetic is in place. Utilize natural materials such as wood or greenery to instill a soulful element to the decor. Here, a two tone scheme, reserved for the cabinets, provides a unique element to the space. A kitchen in a monochromatic palette is about as timelessly classy as it gets. Here, a delicate marble backsplash provides an elegant backdrop for the rows of shelving that line this open layout kitchen. Copper pendants instantly elevate the all-white simplicity of this minimally-furnished kitchen. A potted plant set high on a counter provides a dynamic element to the decor. We’re swooning over the dreamy blues of this Scandi-chic kitchen, decked with warm wood details and one seriously stylish marble backsplash. A splash of color, found on the extended kitchen island, contributes an element of contrast to an otherwise sparsely decorated kitchen. A stainless steel backsplash is only a logical complement to a black kitchen surround, right? Note how the cabinets are extended high up along the walls, to impart the illusion of higher ceilings. We’re swooning over every single one of the stunning details of this country chic kitchen. From the subway-tiled wall to the soft gray cabinets and vintage-esque furnishings, this monochrome space is perfection. What this mod kitchen may lack in terms of decorative elements, it certainly makes up for in the scope of design through its many unique and eye-catching features. Case in point? The lustrously clear globe pendants and the trio of colors that make up the cabinets and counters. File this one under a minimalist’s dream. Dark wood flooring lays out the groundwork (quite literally) for the minimalist scheme of this space, clad with sleek gray details and a farmhouse sink that steals the show. Offset the simplicity of a minimally decked kitchen with a floor tile in an intricately graphic design! Note how the pops of red in the flooring complement the soft gray finish of the cabinets. An intricately patterned backsplash extends a detailed characteristic to this mod kitchen, imparting the space with a relatively detailed and complete effect. The matte finish of the cabinetry in this modern kitchen – coupled with the navy palette and the elegant marble counters – complete its contemporary aesthetic that is simply drool-worthy! Between the blue-gray cabinets and the purposely weathered furnishings, this mod-meets-rustic kitchen manages to pack in major style sans an overcrowded scheme. Monochrome kitchen basics, cleverly arranged by palette, complement the minimalist theme of the space, while the accented flooring lends a dynamic finish to the area. In a kitchen that is graced with an abundance of natural light, charcoal black cabinets work surprisingly well. Coupled with stained wood floors, and white marble counters, it’s pure bliss!